Download the rubric, annotate and turn it into to Schoology. There was no shortage of food sources in the forest areas that blanketed the Northwest region. Deer, moose and elk are just a few of the many animals these Indians hunted on land. The sea, however, is where they got most of their plentiful food supply. Northwest Coast tribes enjoyed various types of fish including Salmon, in addition to whale, sea lion, porpoise, seal, and sea otter. The sheer abundance of food made these tribes wealthy. Their homes were known to be very sturdy and large. Made of plank from cedar, they were both wide and long and put together with wooden pegs. Although there were no windows, there was a small hole in the roof to let fire out and fresh air inside. Most homes were built right along the seashore. Massive canoes were carved from cedar trees. The canoes were known to hold massive amounts of fish in addition to about 20 warriors. Of all the resources available to the Northwest Coast peoples, the two most important were cedar and salmon. Cedar provided the raw material from which houses, boats, baskets, boxes, clothing, and carvings of every imaginable kind were made. The people also used a wide variety of plant resources were used for food, technological items, and medicines. Among the more important plant resources were twelve kinds of berries (most of them smashed, dried into cakes, stored for later use), the starchy roots of camas and wapato, and the roots of bracken fern. Religion centered around the guardian spirit. Each Indian had a guardian spirit that gave them a specific skill such as carving, hunting or even healing. Winter ceremonies were often a time for acknowledging these spirits through song and dance. They were very talented artists and most well-known for their handcrafted totem poles. Totem poles were most commonly found in front of a home to tell a families tribal history through intricate carvings, pictures and colors. With a lack of any written language, these Indians relied on the totem poles to pass down their history, stories, and myths through the generations. They wore necklaces to symbolize wealth. Bear claw necklaces, as well as beaver teeth and clamshells were very popular. Usually held in winter months, the potlatch was one of the most common traditions. The feast was a way to show off wealth. Dancing, gift-giving, storytelling, and eating were all part of the ceremony. Possessions were also sometimes destroyed to show guests that they were so wealthy it didn't matter. Potlatches were a way to celebrate many occasions such as marriage, death, new clan houses and the raising of a totem pole. Because the Northwest Coast Indians had no written language, the totem poles were a very important part of their culture. The totem poles allowed them to record stories, legends, and myths through images. Impressive. Totem poles, with their vivid colors, are the most recognizable of their arts. Every surface of the poles was carved into highly stylized representations of bears, wolves, eagles, ravens, thunderbirds, beavers and other animals, plus human figures. Totem poles could be huge, providing frontal pieces for homes, grave markers and other decorative purposes. Many represented family crests or told stories from family or tribal history. Beautiful and intricate cedar dance masked were carved out of wood. They were often used in storytelling at ceremonies such as a potlatch. Some masks even had a second carved face inside the first to unmask as a story was told. The Indians developed a social system that was highly stratified. There were those at the top- the nobles, the middle- the commoners, and the bottom-the slaves. The First Salmon was an important feast honoring the salmon, one of their most plentiful food sources. They believed the salmons chose to sacrifice themselves for humans so their spirits could go on to live again like humans, in houses under the sea. After reading the information above, see Mrs. Lundgren to answer a question. Brainstorm ideas about mask shapes, animas, etc. 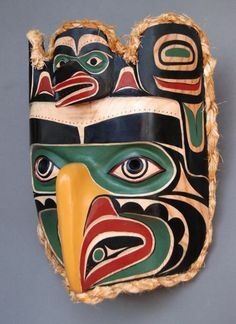 The people of the Northwest Coast, particularly those in the Northern and Central portions of this culture area, are well known for their ceremonial masks. Masks are made from wood, primarily cedar and occasionally maple, which is then painted with three primary colors: black or blue, red, and white. These masks are both art objects and objects with spiritual significance. Masks represent the animals and creatures of the four dimensions of the cosmos: the Sky World, the Mortal World, the Undersea World, and the Spirit World. One of the common themes in the mythology of the Northwest Coast is one in which ancestors come down from the sky and then remove their animal or bird costumes. You will make a mask based on an animal similar to those made by the Pacific Northwest Native Americans. Choose several animals that you may want to use for your mask. Google search the Native American meaning of the animals. Use the meaning to help you choose an animal you feel depicts qualities that you possess. Do 3 different quick sketches to layout facial shapes as well as placement of formlines and shapes. Write a 4 sentence story about your mask meaning. It may be based on the real Native American meaning or you can create your own meaning. Remember you are telling a story that gives meaning to the mask. Be creative! Turn your paragraph into Schoology. The link below has meanings behind common animals found in the Pacific Northwest. Find the list on the left and click on the animal name to find out more about the animal's meaning. The main colors found in Pacific Northwest art are red and black. Black was used as an outline and red filled in the shapes. Other colors that may be used include yellow, white, and blue-green. Masks were used in ceremonies and to act out stories through dance. The women and children didn’t know the meaning of the dances, although they were allowed to watch. They were also used in secret rituals for things like war. 1. Use a milk jug as your armature (a framework on which a sculpture is molded with clay or other material) or ball up newspaper to form the head shape. The jug will be cut in half. Depending on your face shape, you may use the half with the handle or the other half. The non-handle half will need to be reinforced as you paper mache or it will spread under the weight of the material. 3. Tape all the parts together. Use just as much tape as needed with out making the mask look like a mummy. 4. Rip newspaper into strips (about 2” x 1.5”). Dip paper into paper Mache paste and lay over the armature. Strips should crisscross and not be all placed in the same direction. Wrap paper around the edges. Paper Mache shrinks and this will hold it in place. 5. Smooth out wrinkles as you work. Once a wrinkle dries it will become permanent. If you can’t get a piece to lie smoothly, it is too big. Rip it into smaller pieces. 6. You will need 3 – 4 layers. Allow layers to dry overnight. You can do up to 2 layers at a time. 7. Base coat with white paint. Paint face using a style similar to the Northwest Pacific Native American art using ovoids, “U” shapes, etc. Ask 3 people to give you a positive and an improvement for your mask. At least one person should be someone you don’t know well. Make improvements, clean up paint lines, give light colors a second coat, etc.